The City of Great Lunden Kickstarter ENDING SOON! Don’t Miss it. Kickstarter ENDING SOON! Don’t Miss it. 224-page hardcover book detailing the city. The City of Great Lunden Kickstarter is now LIVE! I just wanted to let you know some important news! The Latest Kickstarter from MonkeyBlood Design & Publishing is now LIVE! Following on from the highly successful and acclaimed, 2018 Gold ENnie award-winning 'The Midderlands' campaign setting, and the follow-up 'The Midderlands Expanded', the setting gets an intricately detailed city setting, based on a grim, twisted-fantasy, beryl-hued, late-medieval London. 224 page hardcover book detailing the city. Midderzine Issue 1 OUT NOW! Do you need more The Midderlands stuff? Well, Midderzine Issue #1 is OUT NOW! Thank you all for the continued support, and have great weekends! The Midderlands – An OSR Setting & Bestiary won a GOLD ENnie Award for Best Cartography at the GenCon 2018 ENnie Awards. It managed to slip ahead of Green Ronin, and a silver-winning Paizo product to grab the top spot. For those who don’t know how the ENnies award system works, you submit your products individually to the 6 judges. This year there were 512 submissions (including podcast and website categories). The judges decide if your product should be one of five nominations in the various categories. The Midderlands – An OSR Setting & Bestiary was deemed to be top 5 by the judges for its cartography! Then, there are 10 days of fan voting. I believe there are some other factors here, but the product with the most votes achieves the awards. As you can see from that, the chances of getting a Gold award are pretty rare, and it relies on fans to vote and support it in the final stages! When I say WE, I mean YOU – yes, you there. 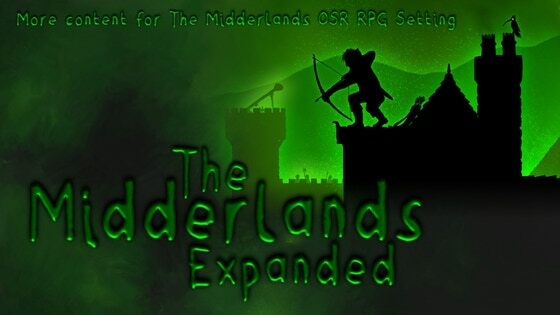 If it wasn’t for the backers of these Kickstarter campaigns, there would be no ‘The Midderlands – An OSR Setting & Bestiary’ to submit. If it wasn’t for Edwin Nagy, Mark Nolan, Jim Magnusson, Juan Ochoa, Matthew Pook, and Peter Day, there would have been no book to submit. If it wasn’t for all the supporters and the people that went out of their way to vote, there would be no award. THANK YOU ALL SO MUCH FOR MAKING THIS HAPPEN. You did this. Special shout out to Matt Hildebrand (KS video), Randy Cieszynski (leather covers), Matt Finch (for S&W and the support), and Jason Hobbs (collecting award on my behalf) and anyone else I have been remiss enough to forget – thanks folks! Now I am off to create more award-winning content! ENnie Voting is Live or going Live shortly! Please consider voting for The Midderlands for Best Cartography! We are up against some strong competition, so every single vote counts! Please also consider giving them your vote! Small publishers massively value your support. Feel free to share and distribute the 'voting flyer'. This is so exciting, and wouldn't even be a possibility without your continued support! Fingers crossed and onwards to victory? Thank you! Glynn and the Team.